and toasted more pine nuts and fennel seed than I’ll use all at once ever again. I fed my starter, building it up to over one kilogram, and called it a night. On Saturday morning, I was back at school bright and early, adding my carefully-prepared elements to the mixer along with exactly the right amount of flour, semolina flour, olive oil, water, and dried currants to make 7.1 kilograms of bejeweled and fragrant dough. Three hours or so later, I shaped the bejeweled, fragrant, and now very lively, fermented dough into fourteen pointy batards, tucked them snugly into their linen beds, and bid them a chilly good night at 46F. 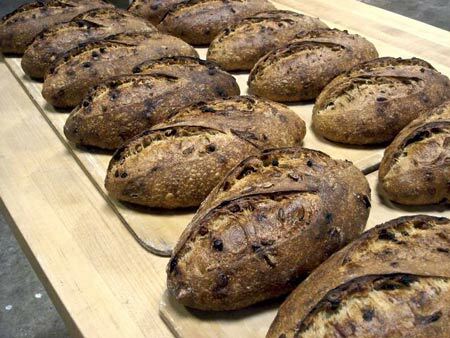 I wondered nervously if these pointy batards could be trusted to settle down to a long, slow proof like they were supposed to. Would I return early Sunday morning to find them plump and energized from a peaceful nap, or would they be spent and deflated after a night of wild yeast partying with the loaves of six of my classmates in that unchaperoned retarder? 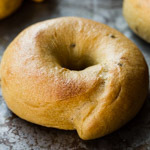 And would they bake up into the deeply-colored, crusty-outside-soft-inside, savory-sweet loaves that I envisioned, or fall flat under the pressure? The short answer is that when I pulled these loaves out of the oven at 7:30 a.m., I was very happy, and satisfied that I was ready for battle in the form of SF Food Wars: Yeast Affliction! Before gathering my weapons and heading over to the battleground, I had my picture taken by what was apparently a very short person (kidding — thanks, Christian!). 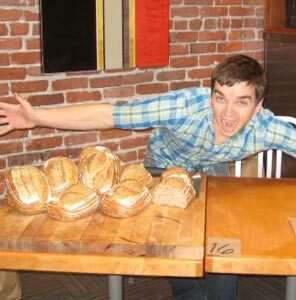 When my friend and accomplice Erika and I arrived at the front (ThirstyBear Restaurant and Brewery in San Francisco), a quick tour of the stations of my nineteen adversaries made it clear that my bread would get a run for its money. 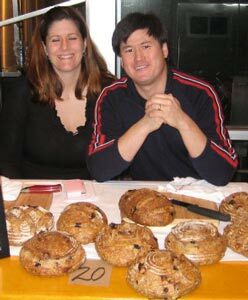 Breads of every persuasion were on display and would soon be subject to the judges’ critical eyes and palates, as well as those of the 200 attendees, who got to taste everything and vote on their favorites. 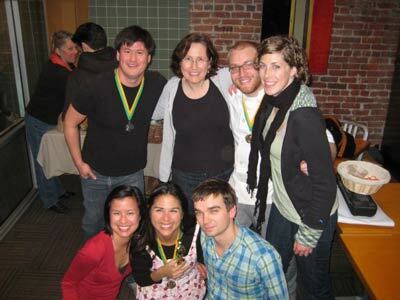 and here are some of the people who had some of the best to offer: my SFBI classmates. and Jesse’s Sour River Loaf (a multigrain sourdough). 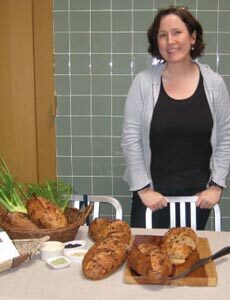 I was particularly partial to Rachael‘s A Nutty Sourdough, with onions, walnuts, and thyme. Heaven. 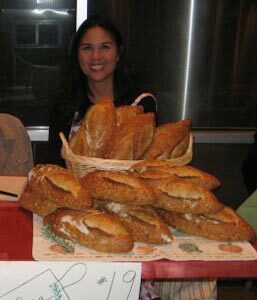 And here’s me with my stuff, not winning this time around but still happy with the wonderful comments from the judges and the crowd, people coming back for seconds and thirds, and quite a few questions about where one can buy my bread (you can’t, but you can bake it for yourself; the recipe is below). 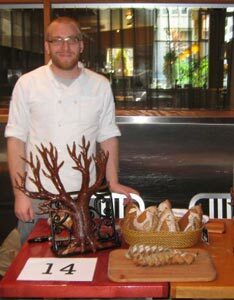 In the heat of battle, I managed to not get photos of the other thirteen competitors, including the People’s Choice, The Hurricane, a multigrain seaweed bread by Fire in the Fornix, and the Photographer’s Choice, Pain a l’Ancienne by The Fancy Boyz. 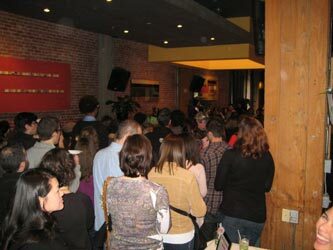 However, photos and impressions of the event can be found in abundance at Mission Mission, Tablehopper, CHOW, SF Weekly, Local Lemons, and the San Jose Mercury News. Assuming you don’t need fourteen loaves, my bread is quite doable in a home oven. 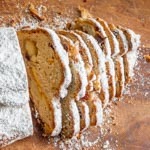 It is very similar to another semolina-fennel-currant-pine nut bread I posted a while ago, but this one has the addition of caramelized fresh fennel, is completely leavened with sourdough, and has a few other tweaks. It takes some time to make, but if you decide to go for it, I hope you enjoy it as much as I enjoyed participating in SF Food Wars with it. 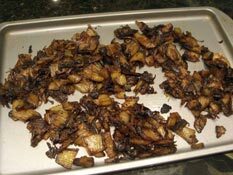 Prepare the caramelized fennel (see recipe below) and cool thoroughly. In a small skillet over medium heat, stirring constantly, toast the fennel seed until fragrant. Remove from the skillet and cool. In a small skillet over medium heat, stirring constantly, toast the pine nuts until golden brown. Remove from the skillet and cool completely. 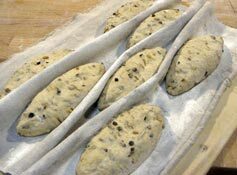 Just before mixing the dough, soak the currants in cold water to cover for 10 minutes. Drain thoroughly. In the bowl of a stand mixer fitted with a dough hook, combine the flour, semolina flour, salt, olive oil, sourdough starter, and most of the water. 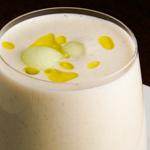 Mix on low speed until the ingredients are well incorporated, about 5 minutes. As you mix, add water as needed to achieve a very soft dough. Add the fennel seed, pine nuts, currants, and caramelized fennel. Mix on low speed just until all the ingredients are evenly dispersed through the dough. Trim any roots, stems, and fronds from the fennel bulb. Quarter it and cut out the core at the root end. 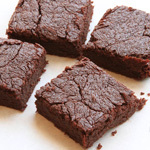 Slice it crosswise into half-inch slices. In a medium skillet over medium heat, heat the olive oil. Add the fennel and salt and toss to coat with the oil. 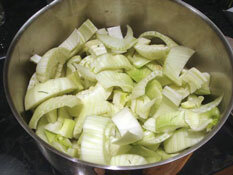 Turn the heat to medium-low and cook, stirring frequently, until the fennel starts to brown. Turn the heat to very low and cook, stirring every 10 minutes or so, until the fennel has caramelized to a very deep brown color and has lost almost all of its moisture. This may take an hour or longer. The fennel’s volume will be markedly reduced. Cool thoroughly before using it in the bread. So where can you by Susan’s bread??? Looks great! I like the idea of using fresh fennel very much! Wow, those loaves look fantastic! Very original! What a fun experience! I just made my first loaf with onions and caraway and am loving the aroma and flavor from additions to the dough. Adding caramelized fennel sounds amazing! you will win next time! At least you got those wonderful comments from the judges and most importantly people came back for more. Lovely to see you here Susan. Oh the other thing is, that I know your bread is delicious. Remember the one that you brought for me last year? Yes, that is the proof. That looks like a lot of fun. 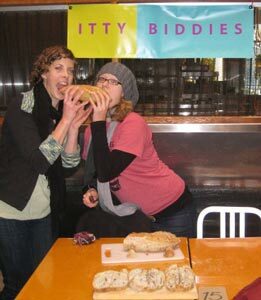 I’m not sure we’ll ever have a bread event that like in Central Wisconsin. Where do you get Semolina Flour? I’ve only seen it in those tiny (and expensive) bags from Bob’s Red Mill. I thought you’d make your original recipe, I didn’t know you had another fennel bread up your sleeve!! Looks like you had a fun time!! 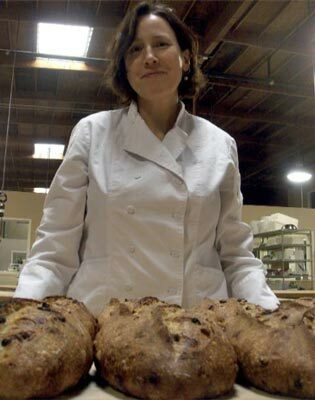 Your bread baking is so inspiring! 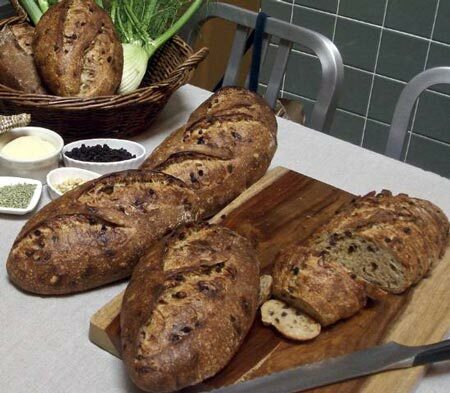 You must have been in heaven…all that wonderful bread and the bakers too! Very cool that there is an event like this in SF, but not surprising. 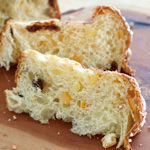 Love the texture of your bread with all those airy holes and bits of fennel and cute pine nuts. 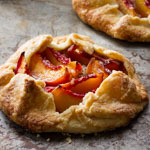 The crust looks awesome, too! Amazing! Smell-O-Vision had me, but when I noticed it contained fennel, well….I was over the edge with excitement. 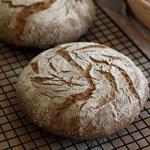 I am bookmarking and hoping to try my hand at this lovely one day in the not too distant future…and if that escapes me, well….I will definitely bake it after I harvest fennel this spring. 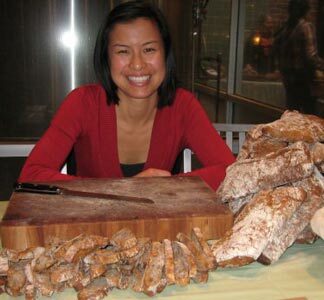 Wonderful bread and great write-up! Thanks, Susan, and congratulations! I have to bookmark this bread for when I get back home and that won’t be before April! Aaaargh! 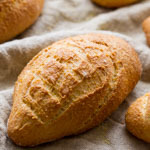 great breads with a very lovely flavours, I need to try the fennel in my bread, we use fennel seeds in some Middle Eastern cookies and bread but not the bulbs. Please excuse me for commenting so late. 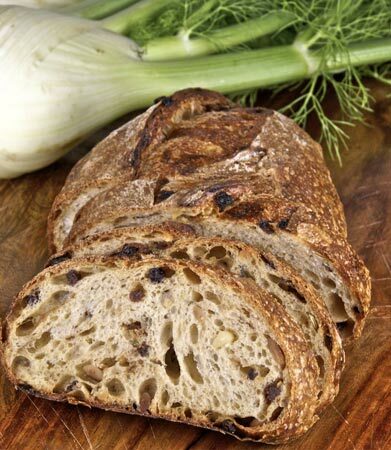 You are brilliant to think of adding caramelized fennel to the fennel-currant semolina bread! And thank you for the reminder to make it again. Any idea how I would go about creating 172 gm of preferment? Perhaps I should make a poolish? But what proportions of flour and water? Do you think 86gm water, 86gm flour and a pinch of yeast?